We’re launching a new blog post series, Member Spotlight, to get to know each other better and share quilty inspiration. 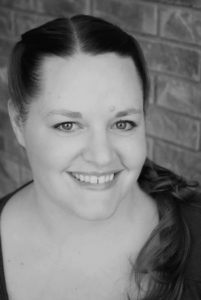 To get us started, we caught up with JaNean Frandsen, a staple in the Salt Lake Modern Quilt Guild. Q: How did you get started quilting? A: I started quilting in 2008, after I saw a Fons and Porter episode with a quilt I actually liked. My grandmother quilted, but she was very traditional and most of the designs/fabric she liked didn’t appeal to me. After I saw that episode I found modern quilting, and fell in love with it. I haven’t looked back since. I originally thought it would be a way for me to give meaningful gifts inexpensively (HA! ), but I have since learned my lesson. Q: What are your favorite quilts you’ve done? A: My favorite quilt I have ever made changes all the time. Here are a few of my favorites though. Swoon is probably my all-time favorite quilt block. 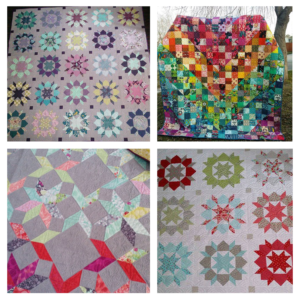 I have made 6 swoon quilts! Q: How many quilts have you started? Finished? A: I am a lousy record keeper. From the top of my head I have gifted 12 quilts, made 15 that we still own, and at least 12 mini quilts. I’m sure there are more, but I don’t remember them all. I have a lot of works in progress, probably 6 quilts cut out and ready to go, 1 lifetime project, and 3 finished quilt tops that need to be quilted. I LOVE choosing fabric for a project and cutting it out, so I always have to have lots of projects cut out. I used to just sew one project at a time, but I sometimes need a break from something so I have to have multiple things ready to go so I don’t get too bored. Q: What do you love most about quilting? A: My very favorite part of quilting is pulling fabric and cutting out patterns. I also love hand binding and pulling freshly laundered quilts from the dryer. Mostly I just love the whole thing. I love sewing it all together, points that match (they make me giggle), and seeing fabric transform into usable art. I DETEST basting. I wish that part did itself, and that step is why I usually send out my quilts to be quilted elsewhere. I also usually make BIG quilts, so I don’t usually quilt them myself unless they are smaller. Q: You started an Etsy shop, tell us about it. A: I started Modern Studio Fabrics in October of 2014 and originally wanted to make coordinated bundles for people in any cut they wanted. That didn’t take off like I hoped, so last May I changed my focus to Basics. I wanted to be the shop you thought of when you needed the perfect background fabric, linen, or cross weave/shot cotton. It has been so much fun to help out customers and make their quilts something special. Q: When did you join the Salt Lake Modern Quilt Guild? A: I can’t remember exactly when I joined SLMQG, but I believe it was either late 2012 or early 2013. I joined the board as historian in 2014, and I moved to treasurer in 2015 and this will be my third year in that position. I have LOVED guild so much. Our monthly meetings have inspired me to become a better quilter, to push myself and work harder to improve my skills. I love having a deadline every month to work for so I can show my work to the rest of the guild. The people are incredible and I have learned so much from everyone, about quilting and life in general. I adore my quilting friends. I don’t think there is a more kind and generous group of people anywhere. Q: Any quilty techniques you want to learn or try out? A: As far as techniques, I am trying to do more curved piecing this year as well as working with templates. Most of the time I learn as I go when I try out new patterns. I have only attended a few classes, so I am mostly self-taught. I have no patience when it comes to waiting to learn something, so if I want to do something, I figure it out. I am hoping to increase my design skills in the future as well. I change or modify almost every pattern I come across, and it would be fun to improve my skill set so I can make my own patterns and designs. 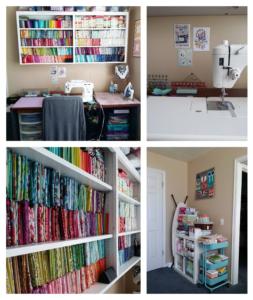 Q: Are you brave enough to show us a picture of your quilting space?